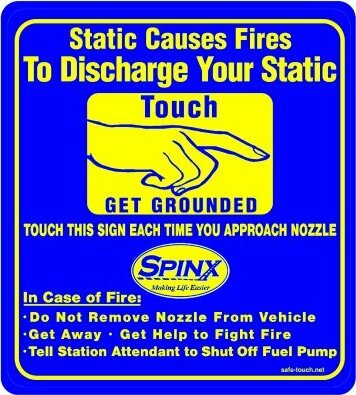 SPINX Oil Company will become the first in the nation to make vehicle re-fueling more safe by placing these decals on all pumps. They should be in place in a few weeks. These decals are made by 5 TAU, LLC in Miami and are called "StaTouch"*. The new static dissipative labels are not just a warning label. They provide a method to gently get rid of a person's static with little or no spark. This makes discharging one's static safe and comfortable. At almost 80 stations around South Carolina and North Carolina, SPINX will place about 1500 static dissipative warning labels. 1. Discharge your static each time you approach the nozzle. 2. In case of fire, do not pull the nozzle out of the car. 3. Get away - get help - to shut off fuel and fight fire. SPINX will also have the nozzle covers labeled with a warning to not remove the nozzle in case of fire. 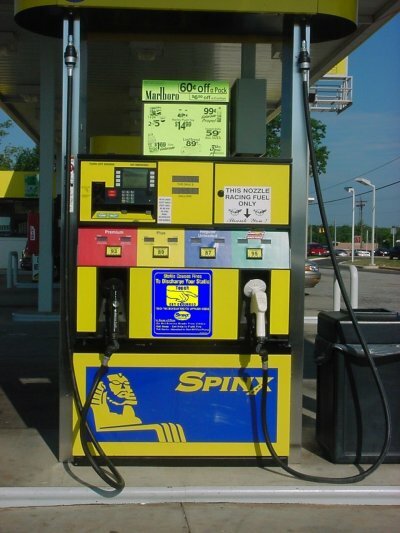 With the efforts of SPINX and Patlon, there should be less fires at the pump and no injuries. If we all follow their lead, we can make refueling a safer act.